Life is all about surrounding yourself with inspiring people. And I will be honest, the biggest reason I get unparalleled joy from running Eccentrips are the people I get to meet. There is so much to learn from others in every aspect of life, and cycling is no different. Today, we talk to a 'Mumbai special' cycling inspiration and get his tips and tricks on how to bring discipline into our cycling lives and plan for memorable rides. While he shares his practical tips, many of you will realise that his own story and life are nothing short of an epic inspiration. Now, let's get into our questions and I will let the cycling leader introduce himself. A quick introduction for readers who may not know you. 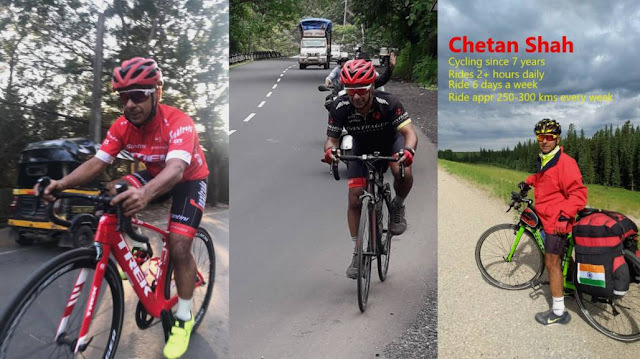 Hi, my name is Chetan Shah, and I am the admin for Mumbai Cycling Enthusiasts – one of the world’s largest cycling groups. I am a cyclist with a difference. Lead a very busy professional life, but have made cycling as the centre of it all. I have managed to alter my work & personal life to allow me to pursue my passion. On the professional front, I run an IT company and commute 3 hours to work daily. Yet I ride over 2 hours daily in the early morning hours, 6 days a week, irrespective of the weather. This passion also leads me to do long cycling tours, endurance events & more. Wow! Now I know that you managing all this despite the backstory of some serious health ailments is more than commendable. Can you share what health issues you faced in the past? I have had some incredible health challenges in life, I suffered from a brain tumour and brain strokes which led to a surgery and eventually lost my hearing in one ear. Then I had a knee replacement surgery. This, of course, means serious limitations in life. 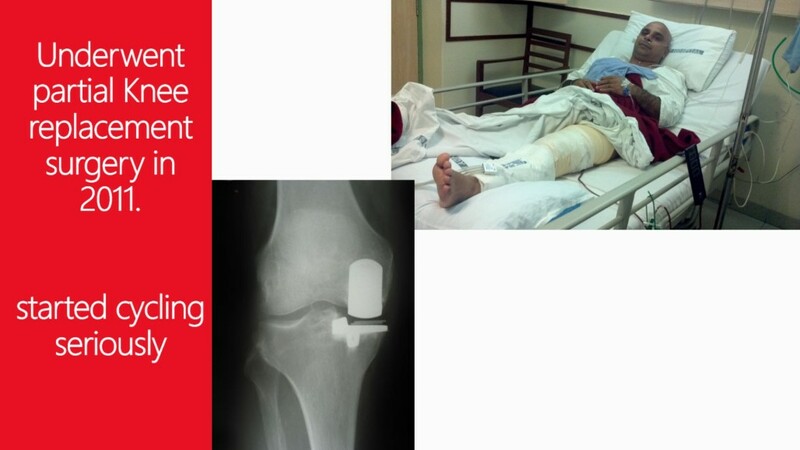 But luckily it allows for non-impact sports like swimming and cycling. Most recently, I underwent a heart bypass surgery with 5 grafts in 2013. Was it also after this that you started cycling seriously? How old were you when cycling entered your life? I started cycling at age 43. I was visiting a mall and saw a great looking mountain bike. So I bought that on a whim and started riding it for about 20-30 min 1-2 times a week. But I took up cycling seriously only after my knee surgery as I didn’t have too many options to lead a active life after that. 'Mumbai Cycling Enthusiasts' has been a big part of your life. How did you become the admin of this group and why? My cycling profile was about riding almost daily, covering thousands of kilometres every year. This also meant that I knew almost all of the cycling fraternity well and interacted with most groups regularly. So the admins of Mumbai Cycling Enthusiasts(this is the link to the FB group) decided to make me the admin to manage the daily operations of the group as the group had grown to about 5000 members by then. They needed a person who could lead it through example and help it grow organically and plan its activities and initiatives. One question that I keep wondering about is whether cycling as a commute in a city like Mumbai will ever be at scale. What are your thoughts about that, Chetan? Mumbai has a growing number of people who are now commuting to work. Its traffic is slowly getting sensitive to the safety of cyclists. With the popularity of folding bikes and the advent of E-bikes, It is going to be practical for most people to commute on a bike. Meanwhile small initiatives from the government like the public bike sharing started in Thane, experiments of bikes lanes in Mumbai and the upcoming bike lane on eastern express highway will also urge more people to take up cycling for their daily commuting. This could take 2-5 years to really start showing results. Now the part which I find most exciting - cycle touring or long distance cycling. You have done quite a few of them. Tell us about them. I have done many bike tours with most of them being self-supported. i.e. bike tour with pannier bags and all accessories and no supporting car. Smaller tours have been 3 day trips from Mumbai to Mahabaleshwar or other places. Longer and much tougher trips include a memorable bike tour across the Spiti region of Himachal Pradesh, two expeditions to Khardung La – the world’s highest road at 18330 feet altitude, Gujarat coastal road trip and a month long trip to Canada, covering about 2500 kms plus a few others. How should one prepare for a long distance ride? A bike tour means having to do detailed planning. Firstly assess your own capabilities to do about 50-100 kms daily. Then select the route and the right dates – depending on the weather in that location. Look up the daily halts and make stay bookings for your chosen dates. A bike tour would ideally require a very sturdy touring ready bike, which can take the load of pannier bags and other luggage, withstand bad roads and give a smooth ride across different terrains that you propose to ride to. Couple of weeks before a tour, I would put pannier bags on my bike and practise riding in the city with loads. This is because the bike’s handling is a bit different with heavy loads as compared to a normally empty bike. Practise to ride 3-5 hours in the city to get used to sitting on a saddle for long. Make a detailed list of bike spares, clothes, accessories and personal things that you will need on the tour. Choose to pack your bike safely in a bike box so that you can transport it in a flight or train. Which are your favourite long distance cycling routes? I would rate my month long Canada trip as one of my most memorable. Recently My trip from Kashmir to Khardungla was also a amazing trip, followed by another recent trip across the Gujarat coastal route. What is randonneuring? What are the pros and cons of it? A BRM is a cycling event in which participants attempt to cycle long distances within a pre-defined time limit. It is a non-competitive sport: success in an event is measured by its completion. Each rider can ride at his or her own pace. The BRMs are 200-, 300-, 400-, 600-, or 1000- kilometer long and riders have to compulsorily ride without any support car or external help. Super Randonneur is a title earned by any rider who completes a series of brevets ( 200, 300, 400, and 600 KM) in the same year. In India, the year starts from November. How must one train to become a Randonneur? There are no shortcuts here. To be able to do BRMs, you need to practise riding for about 80-120 kms few times before you even attempt an entry level 200 kms BRM. It would make prudent sense to talk to experienced BRM riders about their preparations, pitfalls, safety measures, etc. Remember to carefully understand your body’s nutrition and hydration needs during these long distance events. Failing to do these can mean dehydration or other unwanted surprises. Those are the super tips and inputs from Chetan. He also has another interesting and practical tip about goal setting when it comes to cycling or any other form of fitness. 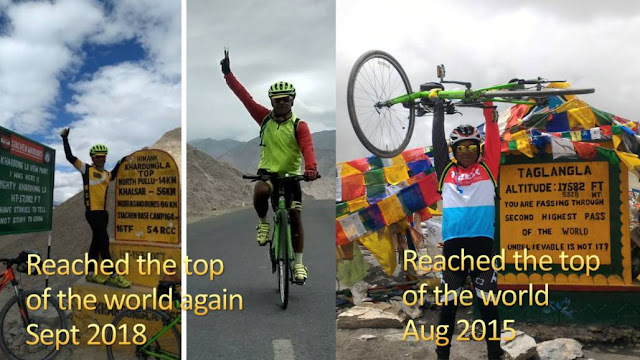 He suggests, rather than setting up lofty goals of 10,000kms in a year or something like that, one must attempt 5 active days a week which adds up to 260 active days a year. And that he says, is more than enough to transform your life. Do let me know what other questions you want answered by cycling leaders. Also, if you know someone who can share a lot of practical information for others like us to improve or to start our cycling life, feel free to share in comments. I will be happy to speak to them in the days to come. Hope you got to learn a few things from Chetan Shah, the inspiring cyclist from Mumbai.